Briar Grace-Smith (Ngāpuhi, Ngāti Wai) is a writer of plays, scripts and short stories. 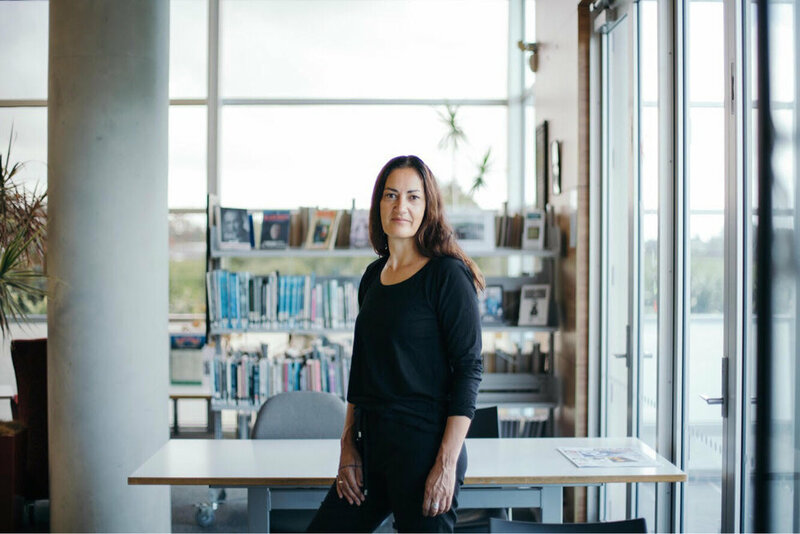 Her first play, Ngā Pou Wāhine, won the 1995 Bruce Mason Playwriting award, and her second, Purapurawhetū, won Best New Zealand Play at the 1997 Chapman Tripp Theatre Awards. Her short stories have appeared in anthologies such as Penguin New Writers and Huia Short Stories. In 2003 she was the Writer in Residence at Victoria University of Wellington. Her debut film The Strength of Water was released in 2009 and in 2017 she was one of eight women who wrote and directed the film Waru. Do you remember the first thing that you wrote? I was eight and I wrote a short story about a rat who got into lots of trouble through no fault of his own. I gave it to Mum who posted it off to a children’s television show called Scribbles who were asking for submissions. One afternoon, weeks later, I was sitting in front of the television watching that show and they actually read my story out, complete with animations (of a sort) of my rat and his friends. I yelled out to Mum who came and watched it too. I remember asking Mum what ‘abridged’ meant. Anyway, as a result I won several packets of Pebbles and all the kids at school saw my story on television. I was popular for an entire day. What was it about playwriting that first captured your attention in comparison with other forms of writing? My mother (who seems to be featuring) took me and several other children, all whānau, to a play at the Hannah Playhouse (now Downstage Theatre). The play was Samuel Beckett’s Happy Days. In it, the world was ending and the two characters spent the whole time buried up to their necks in sand. All the other children who came along fell asleep, but I was completely struck. I learnt that as well as actors and an audience, there was another, unseen, presence in the theatre, and that was the Playwright. The playwright put words into the actors’ mouths. It seemed like a powerful position and one that might suit someone shy like me. I could get someone else to talk on my behalf! After that, my mother took me to more plays, and I began to write small skits for my friends to perform in the cloakroom at school. What was your first play that was staged, and how did you go about taking it from script to performance? I started out in devised theatre with Māori theatre companies Te Ohu Whakaari and He Ara Hou. In both of these companies the performers all worked to their strengths, so while I was an actor, I also did a lot of the writing and editing of our scripts, and started to hone my craft. The first play I wrote alone though was Ngā Pou Wāhine. After seeing the solo play Michael James Manaia written by John Broughton and performed by Jim Moriarty, I decided to write a play for solo performance by a woman because at that point there weren’t enough depictions on screen or stage that were like the Māori women I knew. Most of what we got were stereotypes. Rachel House, who was fresh out of Toi Whakaari, performed, and Nancy Brunning directed. We workshopped the piece together and hired Taki Rua theatre on spec. We were all terrified on opening night but the people came in droves, we paid the bills and I felt encouraged to keep writing for theatre. For any young writers interested in writing for theatre, is there anything practical you would suggest they do to develop their craft and get their work performed? It’s important not to keep your writing to yourself – join a writers group, share your work, get feedback and keep developing your craft. Also, set yourself some writing goals and stick to them – write for a bit of time each day – once you break momentum, it becomes so much harder to start again. What would you say informs your work now? Has that changed from when you first started? I’ve always been inspired by some of the same stuff – our old stories, our history, the growing cultural crossovers here in Aotearoa and underdogs usually feature in my work. The world too is becoming smaller and my connections with indigenous storytellers from other countries has meant that we are now wanting to make films together, and that also influences content. But whatever I am writing about is always somehow informed by something urgent. At the moment the environment is taking front seat. There has been some attention lately on the stability of local theatre, especially with Dunedin’s Fortune Theatre closing after 44 years in operation. Does this concern you as a writer? It tells me that our culture is changing, that people are turning their attention away from theatre and switching onto screens. While it does concern me, I’m not worried about theatre becoming extinct. Theatre as a form is resilient and versatile, a play doesn’t need a building to survive. It is solely dependent on humans and that is its power. All you need is a story, the actors and the audience. I watched the Taki Rua production He Kura E Huna Ana the other week, it’s a play made for touring and while the story was complex, its power definitely lay in its simplicity. It could be staged anywhere. As well as writing for theatre, film and television, you’ve also published a number of short stories. How do you find moving between the two mediums of script-writing and prose? I’ve always written short stories and occasionally, if they have a strong sense of dramatic action, I turn them into plays or screenplays. The difference between the mediums is that with prose you can go deep inside your character, and with scripts the internal thoughts remain as subtext. Right now, after a long break I am writing a short story and loving being able to explore, with words, my character’s dreams and desires. How did you become involved in the film Waru? As one of eight writers working on the project, what was the collaborative process between you and your fellow writers to create the film? It had been nearly thirty years since a feature film was made by a Māori woman, that being Merata Mita. With that in mind, BSAG Productions made a call for Māori women directors to step forward. Their idea was to make a feature film, made up of eight short films, tied together in story by the death of a child through domestic violence. To add to this, each story had to feature a Māori woman lead, take place in the same ten minutes of the same day and be filmed in just one shot. The successful writer/directors (there was one team made up of a writer and director) spent a few days in workshop actually coming to terms with the story – domestic violence, especially given the bad press Māori have around it, is not something to be taken lightly. We then completed the first draft of our scripts. We continued to support each other, including being on set for each other’s shoots. It was an unforgettable experience. You’ve also recently directed your own scripts, with your short film Nine of Hearts and your section of Waru. What has that process been like, as opposed to someone else directing your work? As a writer you walk inside your story as you work, so in my experience, taking it out of my head and giving it a physical life has felt a pretty organic next step. One of the film scripts that I am writing now is so much my own voice, that I know (or hope) I am the best person to direct it. I’m just not sure anyone else will get it! However, there are also benefits to having someone else direct your work, they see things that you don’t and bring a fresh and often beautiful perspective to it. There’s room for both. You are a huge proponent of Māori theatre. What is exciting you most about Māori theatre this year? When I first started working in Māori theatre – under the auspices of Māori theatre companies and Taki Rua – it was an exciting time for all of us. As an emerging playwright, Taki Rua was a place I would often hang out in, I would dish out scenes of my plays and have my mates workshop them. When the theatre closed its doors we kind of lost our community. Things went very quiet for a while. However, I am happy to say that thanks to the work of companies like Tawata and Taki Rua Productions, who are not only producing work in Te Reo but continue to train and upskill new talent, Māori theatre is starting to fly again. I hold great hope for the future. In June you became an Officer of the New Zealand Order of Merit for services to theatre, film and television – congratulations! Looking back over your career, what are you most proud of? I realised when getting this award that I can’t single out one thing that I feel proud of, if I do I will see good bits inside of it and bits that I would like to change, it’ll always be like that. So I’m just proud I have a decent body of work behind me. And not a dead body either, the great thing about plays is that they have infinite lives. I have two feature film scripts (one at a later stage, one at an earlier stage). One of these is the screen adaptation of Cousins, the novel by Patricia Grace, which I hope to co-direct. A highlight of the writing process was co-writing with Patricia herself. We both write in different mediums but have a shared appreciation of a good yarn. It was so much fun and I felt lucky to be in the room with someone who had lived in the era we were writing about. Patricia is a stickler for detail. She also makes the best fish soup!